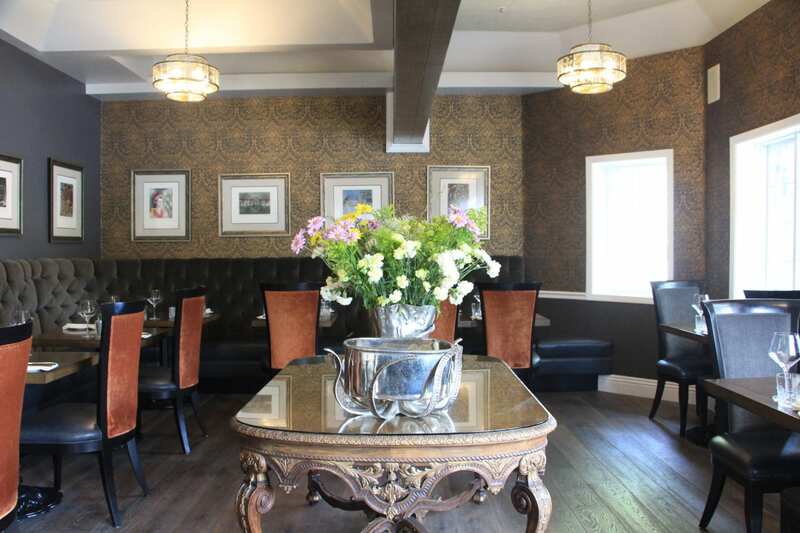 Restaurants at many boutique inns in California are destinations unto themselves. These award-wining restaurants feature world-class chefs crafting exemplary farm-to-table cuisine that draws upon the bounty of local farms, foragers, fisherman, ranchers, and winemakers. Some even feature vegetables and herbs grown in the restaurants’ own nearby farms or on-site gardens. For California Restaurant Month, I’ve compiled some of the most outstanding restaurants I’ve encountered at California’s boutique hotels and bed and breakfast inns. The menus at the Michelin-starred Farmhouse Inn rely not only on what is fresh and seasonal in Sonoma County, but on what is perfect, unexpected, and delightful. Executive Chef Steve Litke sources many of the ingredients straight from the nearby ranch owned by Joe and Catherine Bartolomei, who are co-owners of the inn. Chef Litke’s menus also feature discoveries he makes at local farm stops en route to the inn. With only 14 candlelit, white linen-draped tables, the restaurant provides an intimate, romantic setting. The restaurant’s service is friendly, yet sophisticated and carefully orchestrated to the smallest detail. The restaurant is open every Thursday through Monday beginning at 5:30 p.m. In March 2019, the Farmhouse Inn will launch their new all-day, farm-to-fork dining experience, Farmstand, which will feature casual, local farm-driven cuisine seven days a week. In Chef John Cox’s hands, a dish as humble as meatloaf takes a gastronomic turn into greatness at Fess Parker Wine Country Inn & Spa’s new restaurant, The Bear and Star. Having earned accolades for his ventures in micro-regional cuisine at Post Ranch Inn’s Sierra Mar, John is now the leading force behind The Bear and Star, which opened in 2017. Sourcing the meats and vegetables almost exclusively from the nearby Fess Parker Home Ranch, John is kicking the concept of farm-to-table dining up a few notches. The ranch raises over 100 head of Waygu cattle along with chickens, quail, rabbits, pigs, and bees. The ranch also tends to over 200 hundreds of acres of orchards and vineyards. The restaurant’s menu changes daily and is dictated by what’s fresh on the ranch. The restaurant serves breakfast, lunch and dinner daily. 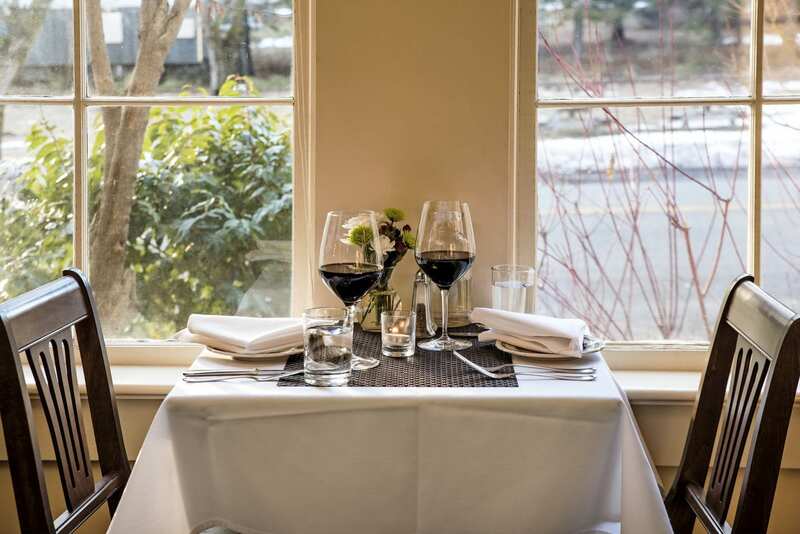 At First & Oak at the Mirabelle Inn, Executive Chef J.J. Guerrero and Sommelier Jonathan Rosenson have teamed up to create a restaurant dedicated to flavor and quality. Seasonal menus feature small plates and an opportunity to create a personalized tasting menu of three, four, or five courses. Although certainly not a requirement, diners are encouraged to choose one dish from each menu section to create a balanced culinary experience. For example, “To Begin” could include Reserve Malossal Caviar or Truffle Roasted Cauliflower; “From the Ocean & Farm” could feature Canneloni of Diver Scallop and Dungeness Crab or Sous Vide Kurobuta Pork Belly; and “To Finish” could be a Caramel Apple Tiramisu. 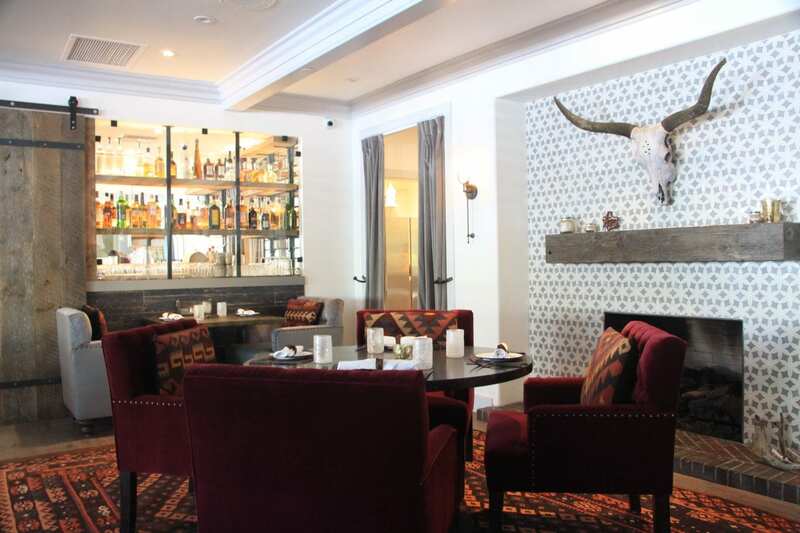 First & Oak offers impeccable service in a chic dining room. Dinner is served daily beginning at 5:30 p.m. Known for his French-Asian cuisine, Chef Budi Kazali refined his culinary skills at high-profile restaurants in San Francisco and Boston before returning to Santa Barbara County to purchase the Ballard Inn and The Gathering Table in 2004. Revamped in 2017, the restaurant shed its white linen tables and fine dining formality for a long, communal farmhouse table and more intimate rustic wooden tables for a cozy, convivial atmosphere. 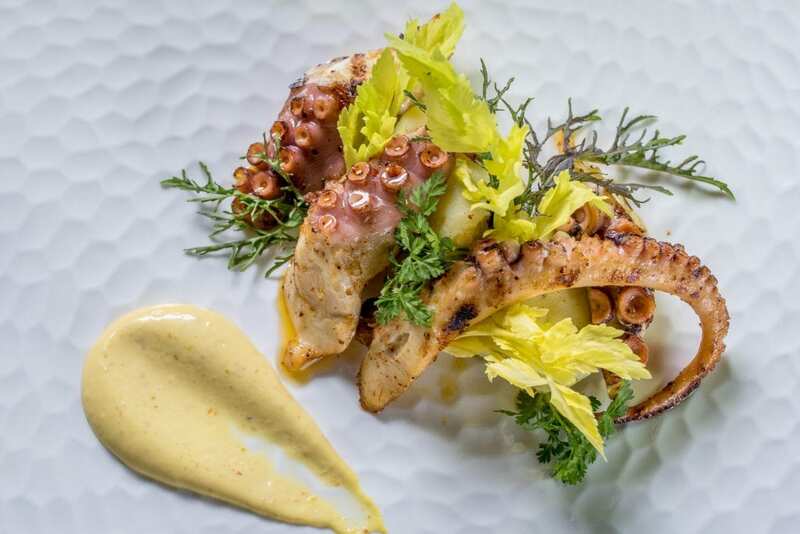 The new dining concept builds upon Chef Kazali’s skillful blending of Asian flavors with classic French-style dishes but features a variety of new and inventive shared plates highlighting local, seasonal produce, and seafood. One standout dish is the Hamachi: melt-in-your-mouth fresh fish layered between slices of avocado, drizzled with a soy-yuzu vinaigrette, and topped with delicate watercress, crispy shallots, and porcini mushrooms. 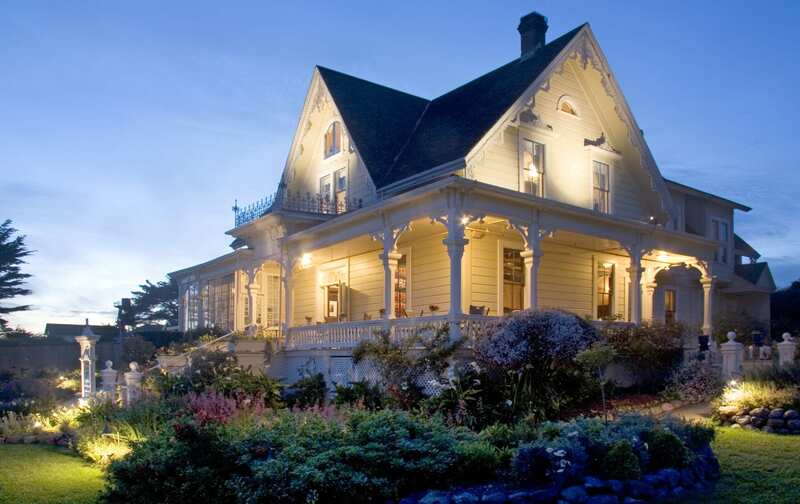 The restaurant serves dinner Wednesday through Sunday beginning at 5:00 p.m.
On California’s redwood coast, Carter House Inns’ Restaurant 301 is considered a destination restaurant by many. The cuisine showcases herbs, greens and vegetables from the inn’s own gardens as well as the region’s finest seasonal delicacies, such as Humboldt Bay’s Kumamoto oysters and fresh salmon from the Pacific. The chefs source fresh, local produce daily to craft artful dishes pleasing to the eye as well as the palate. In the dining room, guests may order a la carte, or enjoy the chef’s prix fixe menu: a memorable five-course feast complete with wine pairings. 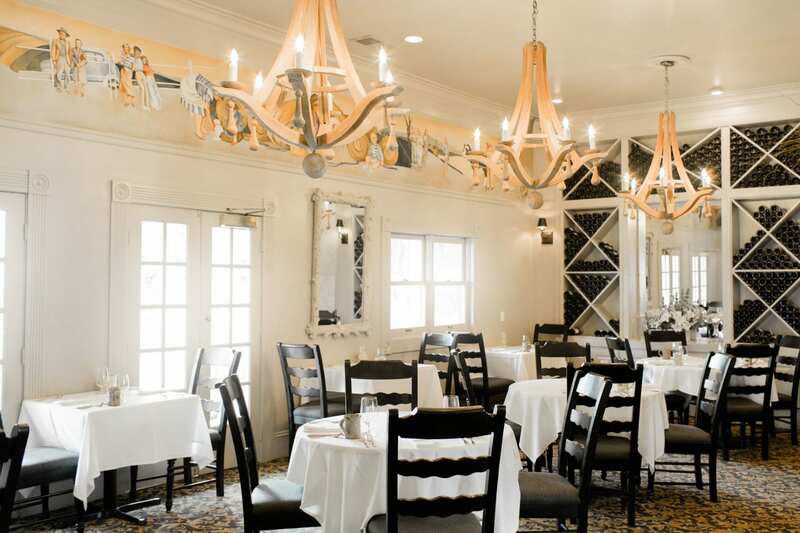 A Wine Spectator Grand Award winner since 1998, the restaurant’s wine list offers several thousand selections, including wines from Carter Cellars and Envy Wines, Carters’ own winery in Napa Valley. Dinner is served each evening beginning at 5:00 p.m. Led by Executive Chef Kua Speer, Nick’s Cove Restaurant and Oyster Bar serves the finest seasonal, sustainable California cuisine sourced from local Marin and Sonoma County farms, as well as fresh, locally-caught seafood and the restaurant’s signature offering: Tomales Bay oysters. 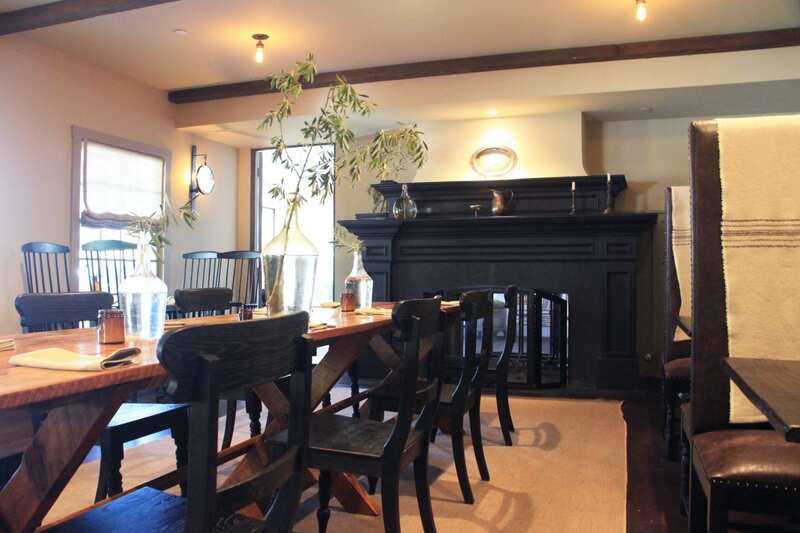 Perched on the edge of Tomales Bay with views from every table, the restaurant has the nostalgic charm of an upscale hunting lodge, complete with restored mahogany bar, woodburning fireplace, reclaimed redwood tables and game trophies on the wall. Nick’s Cove’s on-site farm, The Croft, supplies much of the produce and all of the leafy greens, herbs, honey, and eggs for the restaurant. The 3.5 acre farm is located across the street from Nick’s Cove on a hill overlooking the bay. The restaurant is open daily for lunch and dinner. The imaginative menu of Sage Restaurant at the McCloud Hotel Bed & Breakfast near Mt. Shasta changes with the seasons to include vegetables and herbs from their own garden. Local farmers and purveyors round out the menu with grass-fed beef, sustainable fish, handcrafted cheeses made from raw goat milk and thistle rennet, honey harvested from the base of Mt. Shasta and produce sourced from local CSAs. 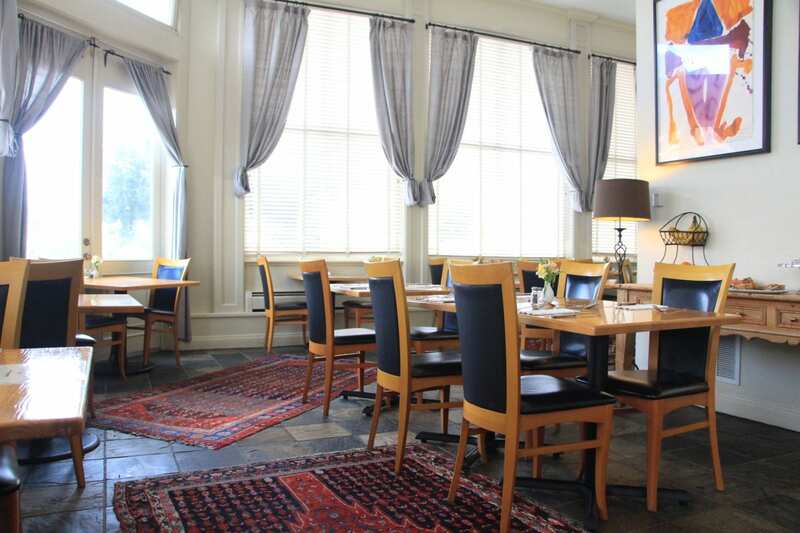 The intimate restaurant, which is located off the lobby of the historic hotel, serves elevated American fare with California, French, and Mediterranean flair in a relaxed setting. Outdoor dining is available in the summer months on the wisteria-covered terrace overlooking the gardens. 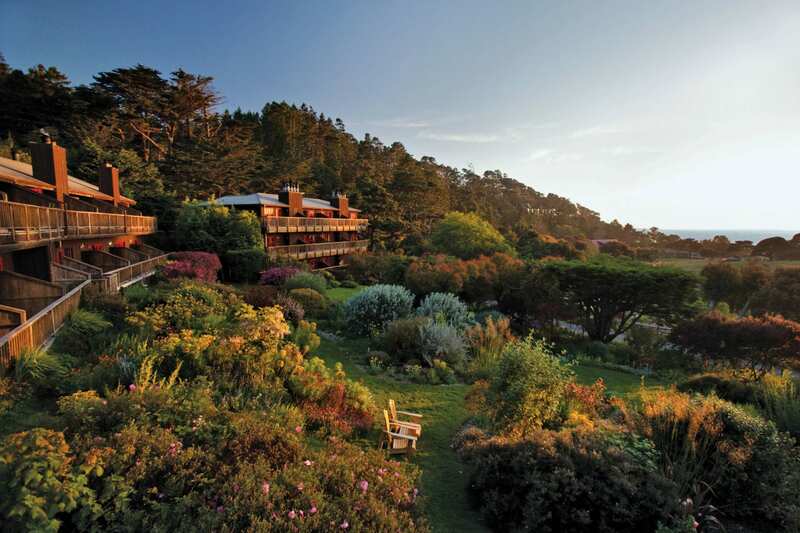 The restaurant is open year-round Wednesday through Sunday evenings from 5:30 to 8:00 p.m.
Overlooking the Mendocino coast, Stanford Inn by the Sea is perched on a hillside nestled amid certified organic gardens. Nearly all of the vegetables and herbs for the inn’s nationally-acclaimed Ravens’ Restaurant come from the on-site gardens and greenhouses. For nearly 30 years, the inn has been using French intensive, bio-intensive, and organic methods to raise a wide variety of lettuces, cabbages, spinach, radishes and vegetables. The restaurant’s inventive vegan dishes are based on locally-harvested products ranging from seaweed to morels. Breakfast is served daily from 8 to 10:30 a.m. and on Sundays, and brunch is served until noon. Dinner is served daily beginning at 5:30 p.m. The menus are continually changing in relation to the availability of ingredients, the seasons, and the creativity of the chefs. 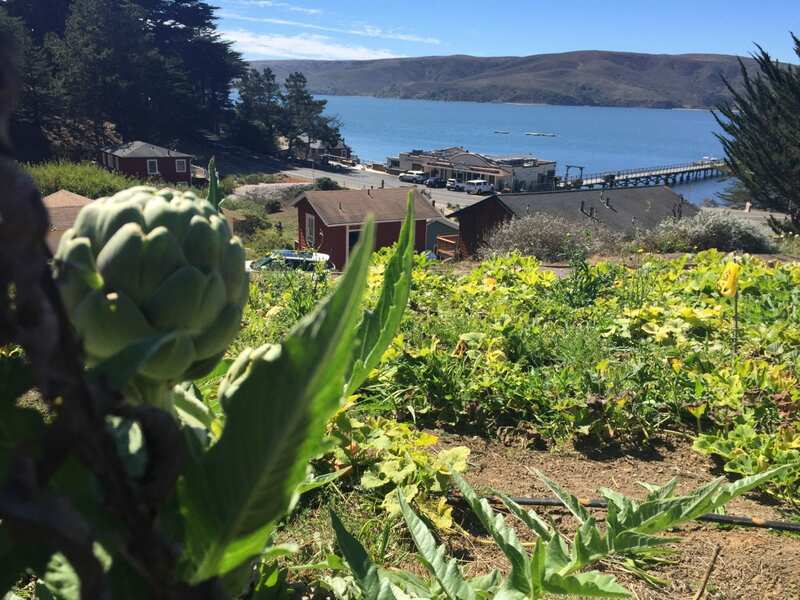 Mendocino’s MacCallum House Inn set the standard for local farm-to-table dining long ago with Executive Chef Alan Kantor’s focus on sustainable farming. Absolutely everything on the menu is prepared in-house, using only the freshest, seasonal ingredients featuring local and regional organic and wild-crafted products. In the romantic, fire-lit dining rooms, guests may select a first course of Pacific Rim oysters, Liberty Farm duck leg confit or roasted gnocchi and chanterelle salad. Second courses may include wild king salmon, bouillabaisse, roasted Rosie organic chicken, grilled Niman Ranch chops and steaks, or one of the evening’s exciting specials. House made ice creams, cheesecake soufflés, bread puddings and crème brulées make for a sweet ending. The restaurant also offers an outstanding wine selection with a focus on local vintages.